A high-level ITF delegation visited Seoul in July and witnessed the trial of KPTU Vice-President Cho; they also visited imprisoned trade unionists at the detention centre. The Convention of the Amalgamated Transit Union - ATU, representing workers in US and Canada, expressed solidarity with striking Korean transport workers. KPTU Trucksol announced truckers will strike on 10th October; TWU Australia's solidarity message was on the screen. Activists from 10 trade unions protested outside the South Korean consulate in Sydney, Australia on 7 October over the Seoul government’s violent attacks and repressive laws against workers, and the jailing of union leaders. Protesters demanded South Korea respect the right of workers to protest, strike and called for the withdrawal of repressive laws which would allow workers to be sacked easily and paid less. Amnesty International, Transport Workers' Union (TWU), Health Services Union (HSU), Maritime Union of Australia (MUA), Rail, Tram and Bus Union (RTBU), United Voice, Community and Public Sector Union (CPSU), Finance Sector Union (FSU), Nurses Federation and PSI, Unions NSW, Inner West Unions (community group), Apheda – Union Aid Abroad (the union movement's aid arm) all attended. New Zealand's Rail and Maritime Transport Union supported Korean workers. Mongolian transport workers stood with their Korean brothers and sisters. FNV Netherlands showed their solidarity for KPTU. Teamsters in the United States supported Korean transport workers. ITF staff and supporters expressed solidarity ahead of the KPTU Trucksol strike on 10 October and the 12 October action day. The railway company Korail filed a suit for damages against the railway union KPTU KRWU for 14.3 billion. It is understood they plan to continue increasing the amount as more 'damages' pile up. Police began sending summons for questioning to local and central leaders including KPTU president Younghoon Kim. In Seoul, the KPTU strike rally and a rally for justice for farmer Baek Nam-gi were carried out together. Japanese railway workers support Korean colleagues. KPTU Trucksol held strike rallies in three places and proceeded to hand out leaflets and to speak to to non-members. Police swarmed into the event at Busan New Port on the pretext that the union was holding an 'illegal rally'. Several activists were injured and several more arrested. Norway's locomotive drivers support their Korean comrades. PSI Asia/Pacific meeting stands together with Korean workers in public services and transport. Workers in Luxembourg send solidarity to Korean strikers. CGT transport workers support KPTU. Thai railway workers join the KPTU struggle. Hokkaido's railway workers send solidarity greetings and stand with the KPTU. ETF stand with Korean transport workers. The KPTU reported that the situation with the truck strike was becoming more violent. Large numbers of police were used to block strikers' protests and attempts to pass out flyers to non-members in Busan and Uiwang. This led to clashes, with violent police reactions. 46 members have been arrested and several more injured. "Meanwhile, the number of workers suspended from job positions in the rail strike has grown to 165. Police are sending summons to central and local leaders based on the Korail's charges of 'obstruction of business'. "This includes KPTU President Kim Younghoon who is supposed to appear by 13 October. "The government has secured 800 replacement trucks and the railway compamy Korail continues to recruit replacement workers. It has announced plans to recruit as many as 3000 temporary workers." A protest was held outside the Korean embassy in London, and included representatives from ITF and PSI as well as from the two largest British unions: the public services union UNISON and UNITE which organises in many industry sectors but is the largest union organising trucking in the UK. The national union centre the TUC also sent representatives. Representatives from Amnesty International were also present. There was a union contingent from the rail union RMT who broke away from a picket in their own three day strike against the privatised rail company Southern Rail to join the protest. ITF Thai affiliates organised a short demonstration in front of the Korean Embassy today and handed in two separate protest letters from ITF-THAI and SRUT were received to an Embassy representative. So far 54 Korean truck drivers and their supporters have been arrested for striking and protesting. Five have been injured. Two are still in hospital. Public sector rally in Seoul: the public sector and railway strike is in its 17th day today, and the TruckSol strike is in its 4th. News reports say that the government is planning a legal attack on the rail and truck union members. The KPTU public services and rail strike is now in its 18th day, the TruckSol strike is in its 5th. Striking TruckSol drivers converged at Busan New Port. Of 55 arrested 53 have been released. Applications for detention warrants for 4 workers were turned down by a judge who recognised the police were going overboard. One detention warrant is still pending. Banner created by KPTU with global solidarity pictures. Day 21 of the public sector strike now centred around the railway union KPTU-KRWU. In the Seoul area two KRWU subway unions ended their strike on the third day after reaching an agreement only to implement the performance pay system after a labour-management agreement. Some other public sector unions have returned to work and over the weekend the Seoul National University Hospital agreed with managers not to introduce the perfromance pay system in 2017. All will join a one-day strike along with the KRWU on 19 October. Despite the government's waiting game, The KRWU remained committed to the long-haul. On the 9th day of TruckSol strike in Busan, police arrested TruckSol President Won-ho Park for supposedly 'blocking traffic'. Thousands of TruckSol members continued to protest surrounded by police with many clashes occurring. KPTU and TruckSol pressed charges against the government for its illegal response to the strike, including suspension of fuel subsidies to participating drivers and relaxing of overloading regulations. KPTU-TruckSol ended its strike after an understanding was reached with the government.The government announced it would propose legislation to strengthen laws on overloading in line with KPTU-Trucksol demands, which involve client responsibility. It also agreed to some changes in regulations on ji-ib contracts to stop unilateral contract cancellations, which was another union demand. The union said that while these changes are welcome improvements they do not go far enough - and so for now the struggle will go on in other ways. TruckSol President Park Won-ho remained in jail, awaiting a judge's decision on his detention. KPTU-TruckSol said "One of the most important outcomes of this strike was expansion of awareness within the labour movement and broader civil society about the safe rates concepts that are at the center of our struggle." "Thank you to everyone who sent their solidarity. This has been very meaningful to our members. We hope in a small way our strike has brought international attention to the safe rates fight." TruckSol President Park Won-ho - whom many will remember from the ITF's Sofia Congress, pictured here - was held under charges of leading so-called 'illegal' rallies/clashes with police. All the Trucksol detainees who were arrested on or prior to 18 October were released on the 20 October - except for the TruckSol president and South Jeolla Branch president. The police applied for detention warrants for both of them. The detention warrant for the South Jeolla president was rejected by the judge but the warrant for TruckSol President Park Won-ho was granted and he is being held in Busan. Mass demonstrations against the South Korean Presidency. One million people rallied in Seoul on Saturday, calling for the ousting of Pres. Park. The ITF was at the head of the unions' march at this historic moment. The rally was focusing on the cronyism and corruption scandal surrounding President Park Guen-hye, which the South Korean unions are linking to the influence of the big corporations - "the chaebols" such as Samsung and Hyundae, over politics. It is this relationship that lies at the heart of the latest attacks on unions in Korea, say the unions. The rally was almost completely peaceful with both the police and protesters both actively working to be restrained. "We are in the midst of a mass movement to end the Park administration, with the real potential to make history; this is being compared to the democratic revolutions of the 1960 and 1987 that brought democracy to Korea" said the ITF-affiliated KPTU. In the lead-up to the mass mobilisation in Seoul, international labour leaders joined the crowds. The rally was being held to protest the brutal crackdown on democratic rights, criminalisation of unions and to call on the resignation of Pres Park who is enmeshed in a huge corruption scandal. 220 thousand striking workers and tens of thousands students, farmers and street vendors gathered in Seoul. Union members from Germny's ver.di show their solidarity with the Korean general strike. Turkish maritime workers say: "Strike for justice!" British and Irish ITF union leaders support Korean workers! 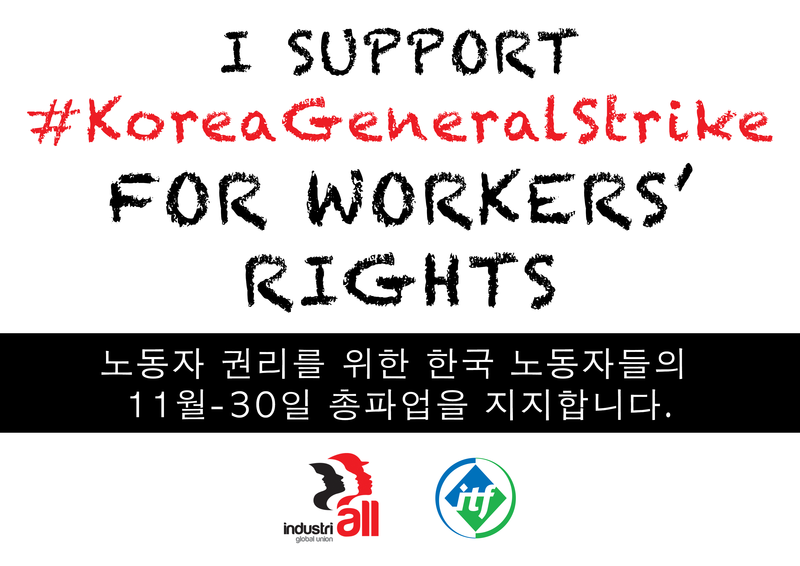 ITF staff demanded an end to attacks on Korean unions and supported the general strike. Canadian unionists supporting the strike at South Korea's embassy in Vancouver, organised by the BC Ferries union and the ILWU Canada. ITF New Zealand affiilates stand with South Korean workers: RMT, E tu union, and First Union at the Wellington Embassy. Korean unions on strike for justice: for resignation of Pres Park Geun-hye and release of all jailed trade unionists. Möglicherweise nimmt die ITF Kontakt zu dir auf, um weitere Einzelheiten zu deinem Beitrag zu erfahren.